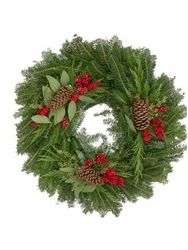 Home > Holidays > Holiday Wreaths > Holiday Classic 20"
This classic Holiday wreath is made with fresh Fraser Fir foliage and is accented with Cedar and Pine Cones. This item is 20" in diameter and will last for 2-3 weeks, depending on the climate. This item is available in Round or Square.